BabyAid- Your First Aid Kit On The Go! We all know how many things we need when going on holiday. One of the things that is on every mum's mind is to have a first aid kit. 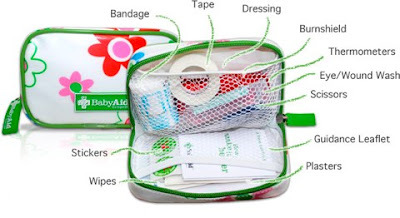 "BabyAid" is a perfect size baby first aid kit on the go which includes everything you need as well as very useful instructions and British Red Cross First Aid guide. I also liked the bravery award stickers, which were highly appreciated by Isabelle, as she absolutely loves stickers!